One of my users ran into an issue recently when launching Microsoft Lync. 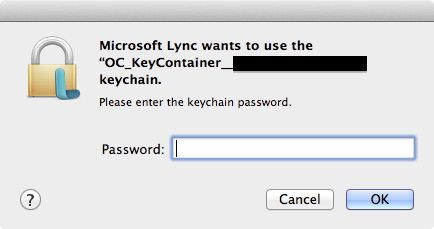 When the Lync application logged into the Lync server, a Microsoft Lync wants to use OC_KeyContainer_username@company.com. Please enter the keychain password prompt appeared. The curious thing was that the keychain prompt would not accept the user’s current login password. When I checked, the user’s login keychain was unlocked and using the current password, so it didn’t appear to be caused by the login keychain password issues that I normally deal with. After some research, I was able to find the answer and get this issue fixed. See below the jump for the details. 3. Remove the OC_KeyContainer__username@company.com file from /Users/username/Library/Keychains. 5. On relaunch, the prompt no longer appeared. Microsoft Lync creates a keychain file to store encryption keys. The file is physically stored in /Users/username/Library/Keychains and is named something similar to OC_KeyContainer__username@company.com. The password for this keychain is not tied to the user’s account password and it looks like the Lync program itself will automatically generate a randomized password for it. The password to unlock that keychain is then stored in the user’s login keychain. Occasionally, something in Lync happens that causes this keychain to refuse to work properly. In that event, a pop-up may appear requesting a password. Removing the OC_KeyContainer__username@company.com keychain file will force Lync to create a new one. When Lync is relaunched, it will generate a new OC_KeyContainer__username@company.com keychain file with a new randomized password and store it in /Users/username/Library/Keychains. An interesting thing about this OC_KeyContainer keychain and associated password entry is that the persistence of it appears to be tied to whether or not Lync is set to save the user’s account password. The OC_KeyContainer__username@company.com keychain and OC_KeyContainer__username@company.com password entry in the user’s login keychain are created when Lync connects to the Lync server. 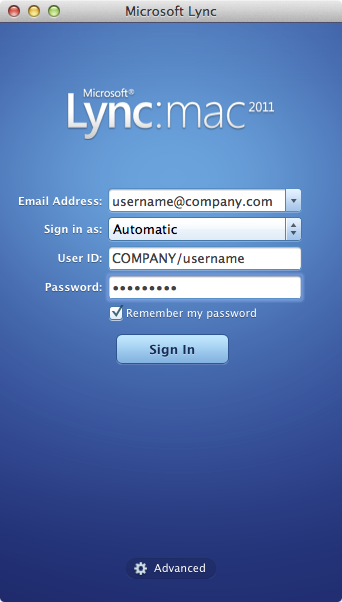 Once the Lync application is quit, the OC_KeyContainer__username@company.com keychain and application password entry are automatically deleted. On relaunch, a new OC_KeyContainer__username@company.com keychain and application password entry in the user’s login keychain are created. If they do not already exist, the OC_KeyContainer__username@company.com keychain and OC_KeyContainer__username@company.com password entry in the user’s login keychain are created when Lync connects to the Lync server. A Microsoft Lync password entry is also created in the user’s login keychain if one does not already exist. Once the Lync application is quit, the OC_KeyContainer__username@company.com keychain and application password entry persist and are not automatically deleted. On relaunch, Lync will look for and re-use the existing OC_KeyContainer__username@company.com keychain and OC_KeyContainer__username@company.com password entry. Totally worked and saved my day from the annoying prompt. Thanks! So, thanks for the article, Microsoft referred me to this to troubleshoot some issues with MAC. However, my users do not have the file @ the location above (step 3) … they are running MAC 10.9.1 and do not have the OC file @ /Users/username/Library/Keychains. Any ideas? I recently updated Office and have the OC-Keychain popup issue with Lync. However, I too do not have the file in my /Library/Keychains folder or in the KeyChain Utility app. So I cannot take the steps outlined. I see Greg S had a similar issue in Feb. Any fixes or ideas? I have tried a a number of things. I even reinstalled Lync. That didn’t work. It worked for me. The specified path was not available to me either through Finder. I was able to access it through terminal. go to terminal and navigate to below path. /Users//Library/Keychains. you will find the OC_Keycontainer_* file in the path. 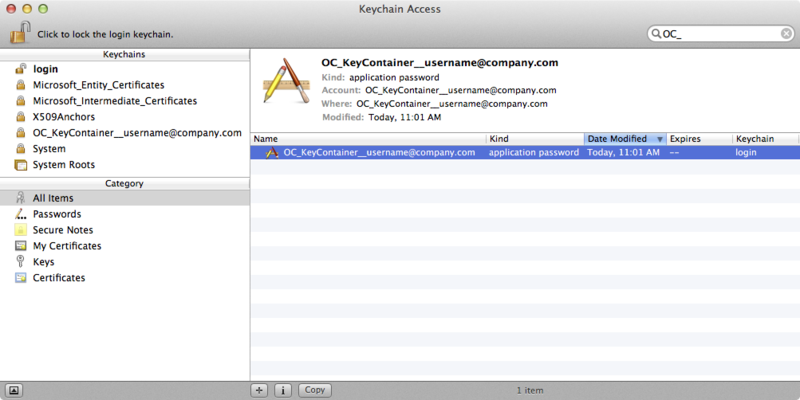 Now just use ‘rm OC_KeyContainer__email@company.com‘ . That will delete the file. Saved my life, need to go with command line ! Thanks, your suggestion works perfectly. Great!! This time i dint have to go back to sysadmin and waste 2 to 3 days for this!!! Reblogged this on Raul E. Santos. You’ll likely not be able to go to userid/Library/Keychains by just clicking through the Finder, you need to get there using Finder’s menu Menu->Go->Go to Folder and type in ‘~/Library/Keychains’ (you can copy paste that). Or Shift+Command+G and put in the same thing. That’ll take you to /Users/’your userid’/Library/Keychains. I know this is really old, but I just found this and it totally worked- hours wasted trying to figure this out so thank you! Thank You So Much!!! That pop-up was driving crazy. Thanks Lisa, This worked like a charm for me. Thanks so much..
Actually, was the only way that works for me on OS Sierra!!! Great, Thanks you so much! Lisa, you are the best! I have been trying every fix I could find and you were the first to give the specific detail on Shift+Command+G and I was finally able to find that #$%@@#$ file! Thank you thank you thank you!!! So what if the directory userid/library/keychains don’t exist? totally worked!!!! Thanks for tip…. This fixed my problem. Thanks for your help. Thanks worked for me! In Finder , hold alt/option and click Go > Library , you will see the keychains folder. Press CMD+shift+G…… write path: ~/Library/Keychains and Delete that one. Thanks for the help! This was annoying me for days. Rich, you’re a beast! Thanks again and as always for posting great info. I have a slight twist on this issue and wonder if it’s related. When starting Excel, PowerPoint, Outlook or OneNote, I get a similar keychain error that reads ” wants to use your confidential information stored in ‘Microsoft Identity 4F7322BE-C519-4E56-9738-1C86EEB7244D’ in your keychain”. The item is in my unlocked login keychain but I can’t monify it to add the last few apps (unrecognized p/w). Then I realized that ALL my keychain items are inaccessible even though my login keychain is unlocked. I noticed this shortly after my in place upgrade to El Capitan. Are these issues related? TIA. Resolved my issue. Thank you for posting this detailed fix. Deleting the OC_Keycontainer in the keychain worked. Hold Alt when selecting the Finder->Go To options as that would also show hidden files. Thanks for the well-explained article!! I love your explanation more than the solution. Thanks heaps! Thanks greatly! This really worked solve the problem. Kudos! Thank you Thank you!!!!!! This is life saver from that annoying prompt. Thank you. That worked for me too. However, I did not see the ‘Library’ folder at first. Once I was inside my home folder, I had to click the ‘gear’ icon in Finder than choose the menu option to ‘Show View Settings’ the check the box to ‘Show Library’. That worked for me. Thank you. yes it was a great help. Is there anyone who could not get the problem solved by deleting the keychain file? I am still facing the issue after deleting it also. For what it’s worth this happened to me after upgrading one of my test machines to macOS 10.12 GM earlier today (either that or my enabling unlock with Apple Watch – but not sure that’s possible). Thanks Rich! Fixed my issue after upgrading to macOS Sierra. Fixed it for me after my machine associated to the wrong network at work. Thank you. I lived with this for too long, thanks for the fix! That was really helpful. Thanks !! Worked perfectly. Thank you for the detailed and accurate info. Thanks a lot buddy. You saved me a hell of a lot of trouble! Run into this problem today. Your solution worked like a charm, thank you very much! This happened to me too. With sierra or otherwise, the name of that file changed when it was recreated to have “-db” added on the end of the file name. I upgraded to Sierra last week and it Lync continued to work numerous times after… until I restarted this morning. Then this issue. Following the removal instructions for the file did not work. What DID work for me was to completely uninstall Lync (I have Clean My Mac 3 and did the uninstall from there.) I reinstalled Lync and it took a while (spinner for about 2 minutes?) but it connected and is up and running. I do not have the oc keychain…. how do i delete it to fix a problem when i do not have it? I updated last night… I have no OC keychains at all and my password is correct yet it gives me this prompt. I try to enter my current password for the LYNC account and it denies me. We run parallels and when I go to the LYNC on that side everything works so the passwords are correct for everything. I guess Ill have to wait on IT to give me a copy of the disk to reinstall? Worked for me, thanks a lot! Thanks a lot, the tip worked perfectly! More than three years this article was written and it is relevant and helpful. Thanks for sharing. I deleted the key chain now it is telling me my sign in failed because my user name doesn’t exist or my password is wrong which both are correct…. Thanks, this resolved my issue. I had to hold ALT on the keyboard for the Library folder to show up for the users. Thanks a lot it helped me. even after removing keychain file, sign in to Microsoft Lync failed because the service is not available or you may not be connected to internet. Worked! How great. Thanks much. Thanks, 3 years later and still a good post. I can’t say thank you enough. This was impossible to solve without this post. Thanks again. A nice simple fix to an annoying problem. Thanks for taking the time to post this. Thanks for this, I started getting this error when I upgraded to Sierra. Thanks, I just had this problem !!! Worked like a charm! This happened to me after upgrading to macOS Sierra as well. OMG! I cannot thank you enough! To find the Keychains Folder – go to Finder, hold the “option” key and then click the “Go” menu at the top and you will see the Libraries folder appear. Keychains is in there. World owes this guy a beer! Thanks mate.. Awesome! Perfectly helpful. Thank you. Thanks! This has been bugging me for a month. This is still happening and your blog is still saving people. Microsoft: must we continue to remind you that you should fix this? Thanks for the tip! Worked great. I’m forced to use Lync to support one of my customers – nice to be connected with them again. Didn’t work at first, but it did after restarting! Thanks a Lot!! This was driving me crazy! Thank You! You save my time! You’re a legend (kiwi term for awesome!) – you saved me a bunch of time, the fix was right near the start of your post and easy to follow. Thanks! Thanks so much. Very helpful. Worked! Rich Trouton, today you are my hero. Thank you so much for posting this! Thanks a lot. Good description. Saved my day. KUDOS !! Many Thanks! Best regards from Germany. Thanks – worked like a charm to eliminate this bothersome problem! 3 years since this post was written and it’s still useful. Thanks a bunch! You are a star! Thank you! How to solve the Microsoft LYNC issue running at Mac OS. When I went into my Library/Keychains folder, that file name was not there: OC_KeyContainer__username@company.com. I am still getting the popup. Any other suggestions? I just recently upgraded both my OS and to CC2018 and had to update my passwords today. Lync automatically logged out and wanted me to enter my new password and that’s when the message started appearing. Thanks for any help.